How Big is a Square of Siding? When you replace the siding on your house, you most likely will spend several thousand dollars. The final dollar amount will be determined primarily by your choice of materials, the square footage of your exterior walls, and the costs of professional siding installation. The following are 2 straightforward ways to get a general estimate of the total exterior square footage of your home. You can then use the figure to estimate and compare total project costs for different contractors and materials such as wood, vinyl and fiber cement. 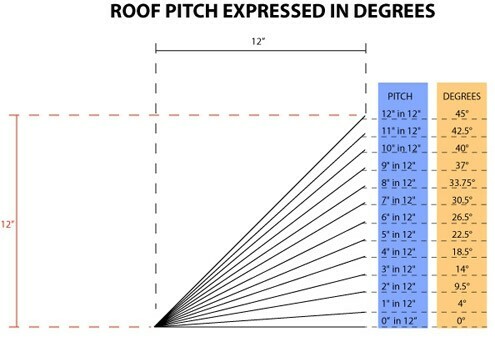 This formula gives you a “ballpark” estimate of your exterior area. It works on most houses, with a variance of +/-200 sq. ft. for most houses. If your house has a more complex layout or is inaccessible, the variance may be +/-500 sq. ft.
Find the interior square feet of livable space in your home. Add the square feet of any attached portion, such as a sunroom or garage. This gives you a “ballpark” figure for the exterior sq. ft. Remember, this is a very general estimation. It gets you close enough to the final estimate that you can decide whether or not new siding is an option that will fit in your budget. To get a more precise measurement for a siding estimate, you will have to measure the outside of your home. To do this, you will need a tape measure, a calculator, and something to write with. 1. Choose one side of your home and draw it. Break it into rectangles and triangles. 2. 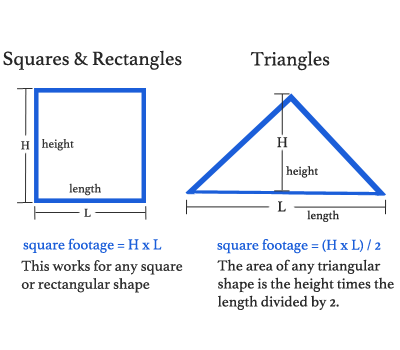 Using your tape measure, measure the length and height of each rectangle and triangle. Write it down on your drawing. If you have partial measurements, round up to the nearest foot. 3. Measure the areas that will not receive siding, such as windows, doors, chimneys, and brickwork. If you have uneven numbers, round down to the nearest foot. This will keep you from running short on siding. 4. Deduct the area of #3 from the area of #2. 5. Repeat steps 1-4 until you have gone around the entire perimeter of your house. 6. Add up all of the totals. The formula below will help you figure the areas. This total will be your number of exterior square feet to be covered in siding. 7. Add 12.5% of the number of sq. ft. to the get the finished total. There will be a certain amount of waste, and of course, there is always a mistake or two that must receive an allowance. So, if you have a rounded total of 2500 sq. ft of exterior wall space, you will want enough siding to cover 2625 sq. ft.
8. Multiply the number you come up with y the cost of siding as figured by sq. ft. For example: 2625 sq. ft. X $5 (per sq. ft.)= $13,125. A “square” is a single unit of siding to be installed on a house and is 100 square feet (10’ X 10’) in size. You will find that waste varies with different siding materials. Part of that is due to the materials themselves, and part of it is due to your home’s configuration. You can expect the waste to be between 10% and 15% of your total. That’s why we suggested a waste allowance of 12.5%. Your siding contractor will also include the expertise of his crews in the allowance, providing for less-skilled installers if necessary. For example, the average house in the U.S. has 1580 square feet of exterior walls area. This amount, multiplied by 12.5%, equals 197.5. That is 197.5 sq. ft. of waste allowance. Add that to your total sq. ft, and you have 1,777.5 sq. ft. Round it up to the nearest foot, and the final total is 1,778 sq. ft. of siding to order. To give you an idea of what goes into estimate siding amounts, consider an average panel of siding. It’s dimensions will be 11.5”H X 144”L. All siding is installed with an overlap to create a weather tight seal, so you will lose about 1.5 inches in coverage per panel. This means that the panel is really only 10”H X 144”L. That is coverage of 1440 square inches. Next, you have to convert 1440 square inches to square feet. 1440 sq. in./144 sq. in. = 10 sq. ft. Sometimes, your exterior wall height will be a few inches taller than the height of accumulated panels. For example, once siding is installed across the wall, you may have an additional 2 inches across the top that still need siding on it. Your siding contractor will have to use a portion of another panel to finish out the top. In some cases, the contractor may be able to use waste from another cut to cover that area, but in other cases, he may have to trim that amount from a full sheet. An experienced siding contractor can help you out by calculating in the use of waste materials. If the siding panels don’t match the height of your walls, there could be a lot of waste. Your contractor may be able to use waste, leaving a panel or two untouched. You can return this to the supplier and get your money back, but you will have to pay a restocking fee ranging from $10 to $100. In addition, if there is an excess of siding on the jobsite, it can get damaged. These figures make it pretty obvious that an expert installer will be an asset. A professional siding contractor will make fewer mistakes when measuring and cutting siding and will be able to use waste. Most experienced contractors will figure out which side of the house will generate the most waste, and start on that side. That gives them waste materials to use up on the other sections of the house. This creates a minimum of waste and reduces the costs of new siding. Other factors that may affect the cost of siding for your home could be the number of windows and door frames your house has, whether or not systems such as HVAC or plumbing will have to be changed, and taxes and inspection fees. The complexity of your house’s architecture will also affect the cost of siding. If you have a single story home with an irregular footprint and complex angles, your siding expense will go up. Your roof slope may affect the cost of siding installation. To estimate your roof slope, go into your attic. Use a 2-foot level. Place it against a rafter, horizontally. Then measure the distance up to the rafter from the other end of the level. Since you are using a 2’ level, divide the distance by 2. This gives you the amount of slope. For example, a 14” distance from the end of the level to the rafter will give you a slope of 7. If your house has a flat roof, siding will end when it reaches the level of the roof. A house with a hip roof is the same – the slope of the roof will not affect the cost of siding installation because there is no area above the eave-line that needs siding. If your house has gables, you will need to know the roof slope. When you enter your dimensions in the calculator, the gables will incorporate the measurements with the roof slope. You want it to be accurate so that you order the right amount of siding. When filling in an online calculator, you will need to enter the number of floors your house has. Then, you’ll need to rate the job complexity. Don’t forget to include any bay windows, bump-out, and Victorian styling with all a lot of decorations. This type of complexity needs a medium-to-difficult rating. You will also have the option to select insulation type. Be sure to enter an accurate number of windows and doors, because each one of them will have to be wrapped to make them weather-tight. All siding should be removed before new siding can be installed. The exception is this: New vinyl siding CAN be installed over old wood siding. Removal and disposal of old siding is usually included in a siding contractor’s estimate. If you are doing the work yourself, be sure to calculate in disposal fees, as you will need permits to access the city dump. Some siding, such as cedar shakes and aluminum, can be recycled. If you have asbestos siding on your home, you have two options. We suggest you cover up the asbestos. New vinyl siding can be installed over asbestos siding, creating a safe, durable finish. However, if you want the asbestos removed, you will have to hire an abatement contractor. Disturbing the siding by breaking it up is what creates the dangers of asbestos dust. Therefore, the abatement contractor will have to cover your house and remove the asbestos shingles or siding. This will cost 3 to 4 times as much as the original siding job. What Should be Included in a Siding Cost Estimate? Any estimates given here are just examples. Costs and totals are rough guesses that should not be used when ordering services or materials. You should, however, get estimates from several contractors. This gives you come comparisons to make on expenses. How accurate were these methods of estimating exterior square footage for your project? Leave a comment below and let us know how you calculated your siding sq ft.